The City of Fruita is a Home Rule Municipality located in the western part of Mesa County, Colorado. Economically, it started out as a fruit producing region, but today it is well known for its outdoor sports such as mountain biking, hiking, and rafting, its proximity to the Colorado National Monument, and its annual festivals. Fruita has been the winner of the Governor’s Smart Growth and Development Award for four consecutive years. The city motto is "Honor the Past, Envision the Future". The original town site was planned for 80 acres (32 ha) with a park in the middle. The first water reached the town from the Colorado River in 1907. By 1909, the town center was linked with electricity. In the 1930s, Fruita participated in several government projects, including the Grand Valley Resettlement Project (later Western Slope Farms). Settled in groups of two or three families per area, 34 families were relocated by 1937. Later, the Rural Electrification Project brought electricity to around 800 or 900 farms. Fruita also had a Civilian Conservation Corps, several Works Progress Administration projects including the town library (now the Chamber of Commerce), a federal loan for the new central school (now the Civic Center) and the construction of the spectacular Rim Rock Drive to the top of the Colorado National Monument, elevation 8,000 feet (2,400 m).Today, the historic activities of Fruita are supported by the efforts of the Fruita Historic Preservation Board and the Lower Valley Heritage Chapter. In 1900, paleontologist Elmer Riggs and crew, from the Field Museum of Natural History in Chicago, found the first known Brachiosaurus altithorax at Dinosaur Hill located off what is now State Highway 340 in Fruita. Led here by communications with Dr. S.M. Bradbury of Grand Junction, Riggs had heard that ranchers had been collecting fossils around the area for 20 years. In 1901, Riggs and crew found nearly two thirds of an Apatosaurus excelsus skeleton (commonly known as a Brontosaurus) on the northeast side of the hill. This is still considered to be one of the finest specimens known. Later, Diplodocus bones were also found, which eventually led to the landmark's name. The animals were from the late Jurassic Age (150 million years ago) and within the 600-foot-thick (180 m) Morrison Formation. Fossils of the Fruitadens (Genus: heterodontosaurid dinosaur), the world's smallest known plant-eating dinosaur, were first found in the Fruita Paleontological Area (within the McInnis Canyons National Conservation Area) off Kings View Road in the 1970s and 1980s. The name means "Fruita tooth". There is a replica on display at the Dinosaur Journey Museum. The museum is a part of the Museum of Western Colorado and has information on local archeology, paleontology, and geology. The region is within the Dinosaur Diamond Scenic Byway and includes two other nearby dinosaur-related sites: Mygatt-Moore Quarry and Trail Through Time off Interstate 70 exit 2. The stone cottage building located at 432 East Aspen Street was built in 1938 by the Works Progress Administration. Originally built as the Fruita Museum in order to house geological displays, it has served as the home of the Fruita Times, the town library (1948–1996), and is currently in use by the Fruita Area Chamber of Commerce. Owned by the City of Fruita, it has been on the National Register of Historic Places since 1996. The two-and-a-half-story, Queen Anne Style stone house at 798 North Mesa Street was built in 1908 by builder A.B. Mahany and first owner Harry Alvah Phillips. It is known locally as the Phillips House and currently run as the Stonehaven Bed and Breakfast. It is bordered by mature cottonwoods, agricultural land, and the Elmwood Cemetery. It is on the National Register of Historic Places. The two-story Neoclassical building located on 325 East Aspen Street was built in 1912 with an addition added in 1936. It was built by the Works Progress Administration as the Central Grade School. In 1993, city and state funds enabled a major renovation, placing it on the State Register of Historic Properties. It currently is the home to the Fruita Civic Center. Fruita is a part of the Mesa County School District No. 51. The city has 4 public schools: Fruita Monument High School, Fruita 8/9 School, Fruita Middle School, Shelledy Elementary School (public), and Rim Rock Elementary School (academy). Colorado Mesa University, founded in 1925, is the closest public higher education institution. It is located in the heart of Grand Junction and supports 13 departments and over 400 instructors. Western Colorado Community College provides higher education instruction for academic transfer programs and career technical programs with nine month certificate programs, two year associate degree programs, as well as other courses for career upgrade. The Fruita Community Center opened its doors in January 2011 supporting community recreation such as basketball, elliptical training, exercise classes, indoor and outdoor swimming, running, volleyball, and weight training. It is a city-owned facility and is located on 324 North Coulson Street. The area surrounding Fruita is renowned for its mountain biking trails. The most notable include the North Fruita Desert/18 Road trail system (Chutes and Ladders, Zippety-do-da, Edge Loop, Joe’s Ridge, Prime Cut, Kessel Run, and others), Kokopelli Trailhead region (Mary’s Loop, Horsethief Bench, Lion’s Loop, Moore Fun, Rustler’s Loop, Steve's Loop, Troy Built, and others). Kokopelli Trail is a 142-mile (229 km) continuous single and double track trail connecting nearby Loma to Moab, Utah. In nearby Grand Junction, the popular Tabeguache trail system includes a shorter trails and a longer connecting trail to Montrose. Road biking is also a favorite sport in the high desert climate of Fruita. Many ride the 46-mile (74 km) loop along the Colorado National Monument overlooking the Grand Valley. The Fruita Farms/Highline Lake Loop is also a favorite taking you from town to the lake and back. Heading west on old Highway 6 to Utah is another scenic road ride. Many common and rare birds can be seen here, including ash-throated and gray flycatchers, bald eagles, blue herons, pinyon jays, and peregrine falcons, as well as some rare breeds such as red-throated loon and red-necked grebe. The best birding locations are the Colorado River, Colorado National Monument and Highline Lake State Park. The Grand Valley Audubon and the Colorado Birding Society are good sources of local information on birding. See also List of birds of Colorado. Locals recreate at Highline Lake State Park for lake boating sports such as jet skiing, water skiing, ice fishing and fishing, as well as birding, hiking and camping. The Colorado River's Ruby Canyon is a favorite day and multi-day trip for kayaking and rafting. Boaters also put into the Colorado River at the James M. Robb – Colorado River State Park off State Highway 340. Adobe Creek National Golf Course, located at 876 18 1/2 Road, offers three nine-hole courses nestled along Adobe Creek and the Colorado River. There are four golf courses available in Grand Junction. There are hiking and horseback riding trails of variable lengths available in nearby McInnis Canyons National Conservation Area including Devil’s Canyon, Pollock Bench, Black Ridge Canyons Wilderness (Knowles Canyon, Mee Canyon, Moore Canyon, Rattlesnake Canyon), Colorado National Monument (Canyon Rim Trail, Coke Ovens Trail, Liberty Cap Trail, Monument Canyon Trail, Otto’s Trail, Serpent’s Trail, Window Rock Trail), Dinosaur Hill, Highline Lake State Park, and Rabbit Valley. Town parks in Fruita include Circle Park at the junction of Mesa Street and Aspen Avenue, Comstock Park at 725 Galena Circle, Heritage Park at 210 I-70 Frontage Road, Little Salt Wash at 1135 18 Road, Raptor Skate Park at 273 North Cherry, Reed Park at 250 South Elm, Roberson Park at 280 West Roberson Drive, Triangle Park at 103 South Coulson Street, and Veteran’s Memorial Park at 342 Hwy 340. The James M. Robb Colorado River State Park encompasses 890 acres located on State Highway 340. 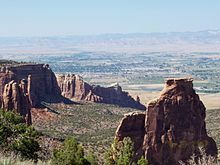 The Colorado National Monument is almost 20,500 acres (83 km2) of semi-arid wilderness, rising more than 2,000 feet (610 m) above the city of Fruita. Native wildlife such as eagles, bighorn sheep, and mule deer can be seen in the area. The Riverfront Trail system follows the Colorado River through Mesa County through cottonwood groves, wetlands, and marshes. It is home to over 200 different species of birds, three endangered species of fish, and an abundance of small animals. The trail project is still in progress and plans to connect Fruita to Palisade via a paved recreation trail. The project is a collaboration of several cities, Mesa County, and state agencies and overseen by the Colorado Riverfront Commission. Rimrock Rodeo takes place from June through August every Tuesday evening through the summer. A series of events showcase riders: there is a “Mutton Busing” event and the Professional Rodeo Riders “Grand Entry” event. Fruita runners take part in town races such as the July PteRANodon Ptrot, the February Sweet Heart Run, and the annual Rim Rock marathon held in November atop the Colorado National Monument. Trail running is also popular and takes place on any of the hiking trails. The Desert RATS Trail Running Festival includes 5, 10, 25, and 50-mile (80 km) trail races in April, as well as the Desert RATS multi-day supported trail race along the Kokopelli's Trail from Loma to Moab. The city is scattered with public art sculptures, some metal, some stone. There are no private galleries, but several businesses rotate displays of local artists' work. Every summer the City of Fruita puts on a summer arts camp for children and adults. The natural landscape and recreation have inspired countless painters, photographers, and sculptures to create works of art. The Fruita Arts & Culture Board supports and advocates for artists and activities in town. Major music events of the region include the Summer Thursday night concerts Country Jam and Rock Jam in the nearby town of Mack. Shows also take place during the annual Fat Tire Festival and the Fruita Fall Festival. The Mesa County Public Library - Fruita Branch is housed in the Fruita Community Center at 324 North Coulson Street. Nearly 7,000 square feet (650 m2), the facility includes a reading room with fireplace, program room and meeting rooms. The Fruita Times newspaper, the Grand Junction Sentinel, and the Grand Junction Free Press serve the current events needs of the region. There are several active civic groups, including the Fruita Lions Club, Fruita Masons, and Fruita Rotary Club, as well as the non-profit Fruita Thrift shop that has been supporting the town's activities for over 50 years. Fruita town events include the summer Farmers Market, Summer Thursday night music concerts and arts & crafts fairs three times a year. Single-track mountain biking enthusiasts and friends have been celebrating the hundreds of miles of world class mountain bike trails around the area of Fruita and western Colorado at this festival since 1996. The three-day fest includes races, live music every evening, a beer garden and legendary parties. It is held every year at the end of April. Fruita is known for Mike the Headless Chicken, a chicken who lived for 18 months after his head was cut off. Lloyd Olsen, the remover of Mike's head, continued to give him food and water with an eye dropper. He grew to be almost 8 lb (3.6 kg). Mike went on to tour the country as a side show. A festival in his honor is held each May in Fruita. Voted "Best of the West" by the Grand Junction Daily Sentinel's readership in 2001, 2002, 2006, 2008 and 2009, the Fruita Fall Festival is the granddaddy of festivals on the Western Slope. This festival started in 1910 as a harvest festival for the local fruit production industry and has evolved to a major event. It includes three days of events with music, carnival rides, a parade, a bed race, a baking and canning contest, a youth pet and talent show, two stages of music, and arts and crafts vendors. The event is celebrated on the last full weekend in September.